Erin and I are so excited to announce our upcoming “Chasing the Pacific Sunset” Spring 2018 LA Tour. 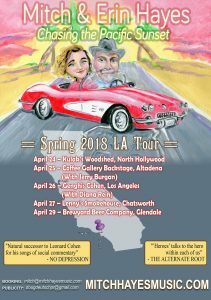 Tour dates and shows are: April 24 Kulak’s Woodshed in North Hollywood, April 25 Coffee Gallery Backstage in Altadena, April 26 Genghis Cohen in Los Angeles, April 27 Lenny’s Smokehouse in Chatsworth and finally Brewyard Beer Company in Glendale. Thanks to Doug W. Deutsch, my publicist, for helping to line up this tour. Thanks to all the fantastic venues and owners willing to take a chance on an unknown duo from North Carolina. Thanks to Matt Lindi for his amazing poster design and thanks to Shane Manier for the original artwork. If you live in or near LA, we hope you will come out to see one of our shows. See you in Sunny California!